Love it! Good quality and looks great on my black and white dog! Hugger, our four-year-old Chow/Lab mix looks great in this collar. It is well made and very attractive. I like the fact that it's machine washable too. Hugger loves to dig in dirt and play in mud which makes washing a necessity. 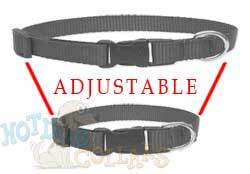 This collar is very adjustable with great attaching hardware. I'd buy one like this again for her in a heartbeat.